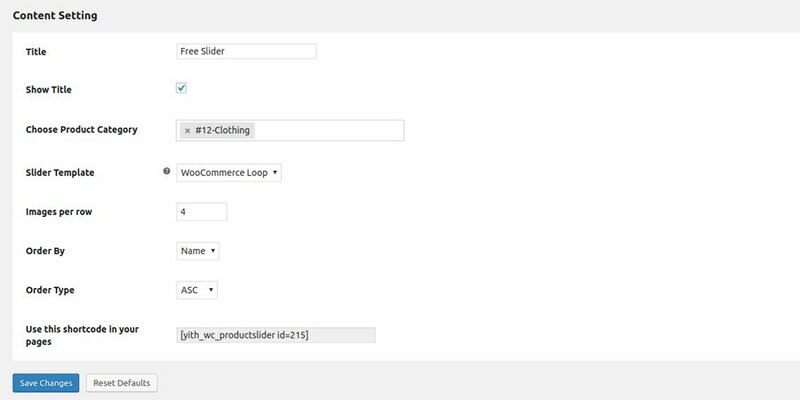 The free version of YITH Woocommerce Product Slider Carousel allows creating a single product slider to be inserted in your site pages. 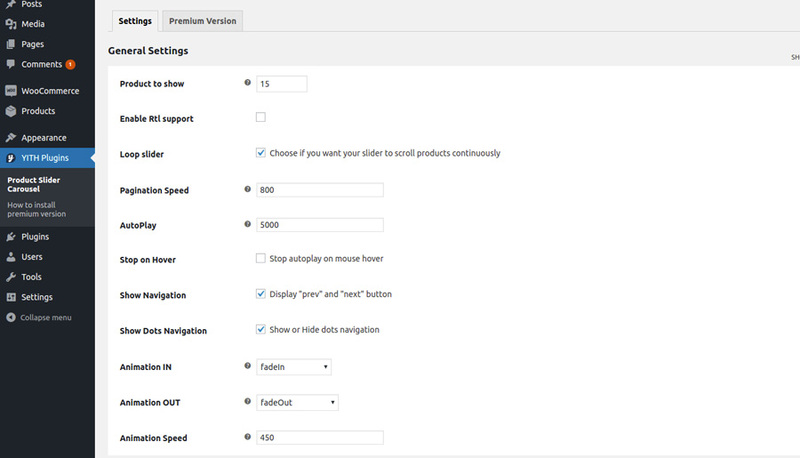 To configure the sdider, go to YITH Plugins -> Product Slider Carousel. Products to show: amount of products to show in the slider. Enable Rtl support: enable/disable Rtl behaviour in the slider. This implies that products will scroll from right to left. Loop slider: enable/disable infinite loop for products shown in the slider. This means that when the last product is shown, the sliding scroll will not stop, but will start again from the first product on. AutoPlay: set a time delay in milliseconds that has to pass before the slider starts showing products in the shop. Stop on Hover: if this option is enabled, the sliding will be stopped when the user hovers with the mouse over one of the products shown. Show Navigation: show/hide navigation arrows in the slider. Show Dots Navigation: show/hide dot navigation in the lowest part of the slider. Animation IN: entrance animation for all products in the slider (option available only if the slider shows one product at a time). Animation OUT: exit animation for all products in the slider (option available only if the slider shows one product at a time). Animation Speed: duration of animation effects. Title: title shown on top of the slider. Show Title: show/hide title of the slider. Choose Product Category: enter here the categories for which you want to show products. If the field is left empty, product belonging to all categories in the shop are shown. Images per row: amount of products shown at a time. Order By: sorting visualization of the products (name, price or publication date) for the discounted, free, and featured product type. Order Type: increasing and decreasing value of the “Order by” option for the discounted, free, and featured product type.